Some researchers in ancient anthropology say they have found evidence in Sumarian clay tablets, artwork and passed-down mythology that visitors from other worlds were on Earth an estimated 6,000 years ago. 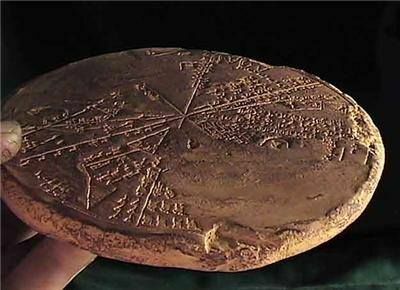 The theories are not only supported by the stories carved on the clay tablets and images in the art, but by the knowledge the Sumerians had concerning our Solar System and the universe surrounding it. They lacked telescopes that allowed them to see and identify the planets and moons around them, yet they had knowledge of these things, according to Dr. Sasha Lessin, author of Anunnaki: Gods No More and producer of the website enkispeaks.com. Lessin’s thesis is supported by the writings of numerous other researchers including Paul von Ward, author of We’ve Never Been Alone: A History of Extraterrestrial Intervention, and the late Zecharia Sitchin, author of The Twelfth Planet and numerous other books. In his books, Sitchin noted that the Sumerians left lists of twelve planets, including a twelfth planet he referred to as Nibiru. The Sumerians mapped the planets, exactly where they are positioned, including Pluto, Neptune and Uranus, which cannot be seen by the naked eye from Earth. On her website, Lessin wrote that a drawing on the 5,000-year-old tomb of Fodhla in Oldcastle, Ireland, contains an astronomical depiction of the “inner solar system” as it also is found on the ancient Sumerian seals. Another amazing piece of information found on the Sumerian tablets is that water exists on Mars, Neptune, Uranus, Venus, Saturn and Jupiter, the rings of Saturn and on the moons of Saturn and Jupiter. NASA space probes and new astronomical technology is only beginning to prove that water either exists, or once existed on Mars, Uranus and possibly one or more of the moons. Modern researchers have yet to prove or disprove water on the other planets, moons and objects circling our solar system. Before Voyager 2 it was believed that Uranus was just a gas giant. The data from the space probe showed that Uranus is covered with “super-heated water.” There are 27 moons circling Uranus and all are now believed to be composed of water and rock. Neptune, like Uranus, is no longer described as a gas giant. Astronomers now see this like Uranus as an “ice giant” since it too is believed to be composed of large quantities of water ice mixed with a hydrogen and helium atmosphere. Jupiter’s largest moon, Ganymede, has been found to contain an ocean of water buried under a thick crust of ice. The Cassini space probe determined that Saturn’s moon Enceladus also contains an ocean of ice-covered water. Even heated Venus, the closest planet to the Sun, was found to have trace amounts of water in the atmosphere. Mars has been found to have at least a trace amount of water but the scarring on the planet’s surface indicates that there once existed oceans, lakes and flowing rivers of water there as well. It seems that the Sumerians knew 6,000 years ago what modern researchers are only now learning, that our Solar system is teeming with an abundance of water. The question now is whether humans can use this information to their advantage as we prepare to follow our ancient benefactors . . . and possible ancestors into space. The Sumerian text also described Uranus and Neptune as "twin" planets in the Solar System. NASA didn't notice this peculiar similarity until 1989, Lessin noted. The planets are alike because they both are surrounded by rings, both have moons, they are both covered by water that appears bluish-green in color. Also both of these giants are of equal size and they spin so they have 16-hour days. All of these things were recorded by the Sumerians in around 4,000 B.C.